The Reserve Bank of India went for a surprise policy rate cut for the first time in 20 months ahead of its monetary policy meet on February 3, 2015. The move brought a much needed relief to the existing and prospective home loan customers who have been paying a high interest rate of anywhere between 10.5 and 12 per cent on their home loan. While a 25 basis point or 0.25 percentage point cut in the repo rate by RBI (at which it lends to commercial banks) is yet to be followed by a cut in base rate by most of the banks, the rate cut news has for now raised the optimism that the economy is set to move towards a low interest rate regime and that will significantly benefit the home loan customers. While economists and experts say that there could be rate cut of up to 100 basis points in the calendar 2015, Express Money tries to explain the benefits that may come your way as a result of the same and the things to watch out for in order to reap the benefits. Since the interest rates are set to go down over the next one year it would not be sensible to go for fixed rate loans even though the banks or housing finance companies may be offering a lucrative interest on fixed rate loans. While ICICI Bank was offering special fixed rate loans to their customers till December 31, 2014, HDFC Limited launched its Trufixed scheme last month that is available till January 31, 2015, where it is offering loan to prospective home buyers at fixed rates for a certain period at interest rates that are close to the floating rates. Within its Trufixed scheme, HDFC is offering an interest rate between 10.15 and 10.35 per cent for two and three years and an interest rate of 10.25 to 10.5 per cent for the 10-year option. While fixed rate loans are generally priced 100-200 basis points above the floating rate loans, customers who want peace of mind on interest rate fluctuation may get tempted to lock themselves at these rates for up to 10 years. However, at a time when the interest rate in the economy has started to go south, locking at fixed rate may not be prudent. If RBI goes for a rate cut of 100 basis points over the next one year then home buyers who go for these fixed rate schemes will miss out on the advantage of a rate cut in the economy and the pass-on benefit that will be available to the floating rate loan customers. The scheme however would have been worth going for, if, it was offered when the interest rates were low and were set to rise. In that case customers could have locked themselves at low interest rates. “As of now the differential between floating and fixed rate may be very small but as the rate cut continues this differential will go up and hence home buyers should go for floating rate loans,” said Vishal Dhawan, certified financial planner and founder of Plan Ahead Wealth Advisors. If banks cut their base rate by 25 basis points following a 25 basis points cut in the repo rate by the RBI then that will result into a marginal dip in your home loan EMI that has only gone up over the last 20 months. For a 20-year loan, a 25 basis point cut would mean a savings of around Rs 17 every month per lakh of loan. So, if interest rate on a 20 year floating rate home loan comes down from 10.5 per cent to 10.25 per cent then the EMI on Rs 25 lakh loan would come down by Rs 418 from Rs 24,959 to Rs 24,541. While RBI has maintained that inflation is expected to remain low at under 6 per cent till January 2016, experts feel that the policy rates may go down by anywhere between 75 and 150 basis points over the next one year. There are others who are a little conservative in their expectations on rate cut over the next one year. “With today’s repo rate cut, the RBI has indicated a shift in its monetary policy stance to ‘accommodative’… Based on the recent macro-economic data and the expected average consumer inflation of around 5 ½ per cent in 2015, we expect at least a 75 basis-point reduction in the Repo Rate on a cumulative basis by March 2016,” said Dhawal Dalal head fixed income, DSP Blackrock Mutual Fund. If that is the case and the base rate comes down by up to 100 basis points then home buyers would have significant savings in EMI payments. 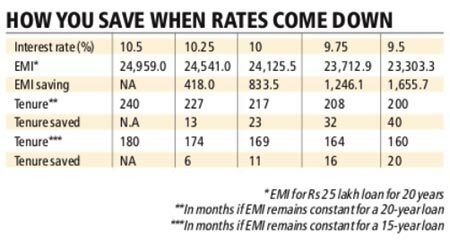 Going by the above example, if the rate goes down from 10.5 per cent to 9.5 per cent, the EMI for Rs 25 lakh loan would go down by Rs 1,656 resulting in an annual savings in EMI of Rs 19,872 for a new customer. For an existing customer, either the EMI can come down by up to Rs 1,656 per month or the tenure on the outstanding loan can go down by up to 40 months for a 20-year loan. If the remaining tenure is 240 months, then the revised tenure will go down to 200 months and in case the remaining tenure of the loan is 180 months, then it would go down to 160 months. While car loans are mostly fixed rate loans, existing customers will not see any benefit but new customers will benefit from a low interest rate regime. Financial planners also suggest existing customers to evaluate their fixed income investments going forward and see if it is better to prepay the loan as the return on fixed deposits will fall going forward. “If your FD is maturing in three to six months then you must evaluate whether to roll it over or to use it for prepayment of your loan as your FD will earn you lower interest rate,” said Dhawan.